Be all in one– the accordionist and the guitarist! The patented TOTTER MIDI GUITARIST® function enables the proper playing of rhythm guitar. The point of the function is that rhythm guitar (guitar chord) is also playing during the first rhythm period together with bass. The way of playing rhythm guitar has its own rules which differ from the way of playing chords on an accordion. 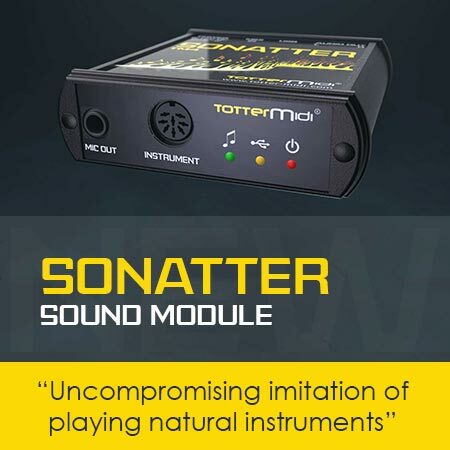 The patented TOTTER MIDI GUITARIST® function analyzes your accordion playing in real-time (live) and generates the correct tonality (tune) and the type of chord (dur, mole, …) for the same rhythm that plays together with the bass. In other words, when you play on your accordion, it will play full guitar accompaniment as well without playback or automatic accompaniment. Because the rhythm is the basis of music, the patented TOTTER MIDI KITARIST® function is indispensable and you simply must have it. With it only sounds the songs compact and rhythmically full. It’s like playing a real guitar player with you. The imitation is rhythmically and harmonically exactly the same as playing guitarists. We developed the function for playing Alpine music. It is also excellent for other musical genres where the rhythm guitar is used, such as, jazz, pop, rock, etc. The patented TOTTER MIDI GUITARIST® function complements our patented TOTTER MIDI QUINTET® function developed for the imitation of blowers, especially in the Alpine ensemble (trumpet and clarinet).